Get 25 commission-free trades from Ameritrade. Europe from $99! Hurry, ends 2/13! ONDON, Feb. 10 � None of the unauthorized photographs from the wedding of Michael Douglas and Catherine Zeta-Jones were the least bit flattering. But the one showing the groom feeding wedding cake to the bride, reproduced in the newspaper The Sun under the headline "Catherine Eater Jones" was perhaps the most unfortunate of all. The telephone of the future is finally here! "I did not want my husband shoving a spoon down my throat to be photographed," Ms. Zeta-Jones said today in the High Court in London, testifying in her lawsuit against Hello! magazine, where the pictures appeared in November 2000. "It looks like all I did was eat." She was also unhappy about the photograph that depicted her looking perhaps too hefty as she danced with Mr. Douglas. "It was extremely important for my career that I regain my figure after giving birth," she said. "I had put a lot of work in at the gym." But frivolous as the case may seem, it has potentially far-reaching legal repercussions. The right to privacy became part of English law when England incorporated the European Convention on Human Rights into its own law in the fall of 2000, but it has been little tested in English courts. If the couple prevail, the case could set a precedent that would move England toward a Continental system of privacy in which, for instance, the news media would be hard-pressed to publish images or details of public figures' private lives without permission. "It's a watershed case," said Mark Stephens, a lawyer specializing in media law. "What would happen, it seems to me, is that it would leave us with primped and preened images approved by Hollywood spin doctors � we won't see them au naturel any more." That would be a terrible blow for London's celebrity-hungry press, which has dozens of publications devoted to scrappily snatched paparazzi shots of stars, the more compromising the better. Even though the industry went through a period of self-laceration after the death of Diana, the Princess of Wales, in 1997, it moved with all due alacrity out of its sackcloth-and-ashes era and began aggressively pursuing celebrities again. The case at hand reflects the deep animosity between Hello! and OK!, which often pay huge sums to subjects. It began when Mr. Douglas, now 58, and Ms. Zeta-Jones, now 33, not wanting their wedding to turn into a media mosh pit, told OK! that it could publish an exclusive set of photographs for a million pounds as long as the couple had complete control over the images. "Both my husband and I wanted to show the world the joy of what we were sharing," Ms. Zeta-Jones said today, describing how they invited 350 guests to the Plaza Hotel in New York, in a ceremony that reportedly cost $1.9 million. They hoped OK! would proceed, she said, "in a classy way." But Hello!, furious that its own �1 million bid had been rejected, hatched an elaborate gate-crashing scheme known internally as the "Douglas/Zeta-Jones project," according to the couple's lawyer, Michael Tugendhat. " One of the Hello! operatives sneaked into the wedding, took pictures with a tiny camera, and sneaked out six grainy shots that were then rushed into a special issue of the magazine. When the newlyweds found out about the pirated pictures, "our peace and happiness evaporated," Ms. Zeta-Jones said. "I felt violated and that something precious had been stolen from me." Mr. Douglas, who also testified today, showed himself to be equally wounded, although under questioning from the lawyer for Hello!, James Price, he did allow that his ordeal in being surreptitiously photographed was "trivial in comparison to losing an arm." Nonetheless, he declared himself disgusted by the "lascivious" photographs in Hello!, and also by its pointed decision to juxtapose pictures of his new bride with a photograph of his first wife, Diandra. It was, he said, "a clear attempt to deprive us of the love and joy of a magical and wonderful event." The lawyer for Mr. Douglas and Ms. Zeta-Jones, Mr. Tugendhat, has repeatedly emphasized that the issue is not whether the couple like the Hello! photographs. But if they had, maybe the case would not have come this far. In one picture, for instance, a worn-looking Mr. Douglas is shown reacting as his new bride playfully threatens him with a cake knife. Mr. Tugendhat said, "One of the unattractive aspects of the Hello! photographs is that there is not a single decent shot of him at all." Find more results for Magazines and Great Britain . 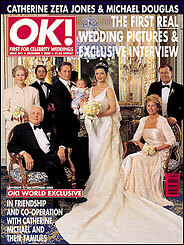 The cover of OK!, a rival of Hello!, featured an authorized picture. Catherine Zeta-Jones and her husband, Michael Douglas, testified on Monday to the High Court in London in their suit against the celebrity magazine Hello! over pirated wedding pictures.